Move over Buddhas - Santa has arrived!! 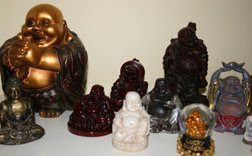 During the year my Buddhas have all th e room they need, they can spread out all over my shelves. 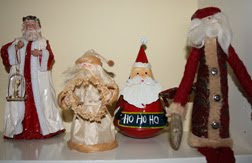 But when December arrives they all have to get a bit cosier to make room for my Santas. My collection of Santas started when I lived in New York and I usually buy a new addition (or 2) each year during the Boxing Day sales. Love the Santas!!!! They look like a great group! Davine, I love your collection of Buddhas! I wonder how you got started collecting them? What about them touches your heart? I am sure they will gracefully give up their place (temporarily!) for the Santas. Enjoy! I bet you watch "The Collectors" on Friday nights!